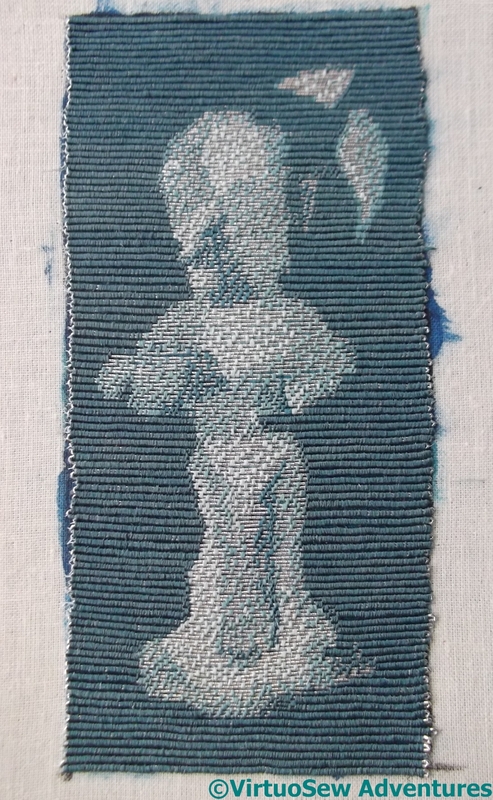 Those who follow me on Twitter will have seen a Tweet full of rejoicings last week – I have finished the Hittite Amulet at last! He’s been quite a challenge, and required considerable stores of patience, but I’m very pleased with him. He’s looming out of the darkness very impressively! I began working on him last July, and got rather less than halfway before I put him away in a boxfile before Christmas when I was getting ready for festive visitors. After Christmas, I decided to concentrate on the Glittering Nightcap, because I was beginning to fear that otherwise I would never finish it, and didn’t begin again on this fellow until May. Since then I have simply persevered. I’ve not written about him, because in truth there is little to say. 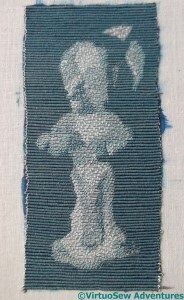 Or nué is a simple enough technique – in essence, satin stitch over a metal thread – it is just that there is a lot of stitching needed before any appreciable change is seen. Although it is a simple technique to describe, doing it well is less so. 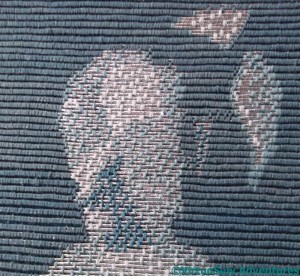 As you can see from the close up of the head, I’ve not managed to keep the rows perfectly even in their spacing or coverage. Perhaps, although I used pre-shrunk calico as the basis, I should have used two layers to make it sturdier (I hope not, it was tricky enough already!) 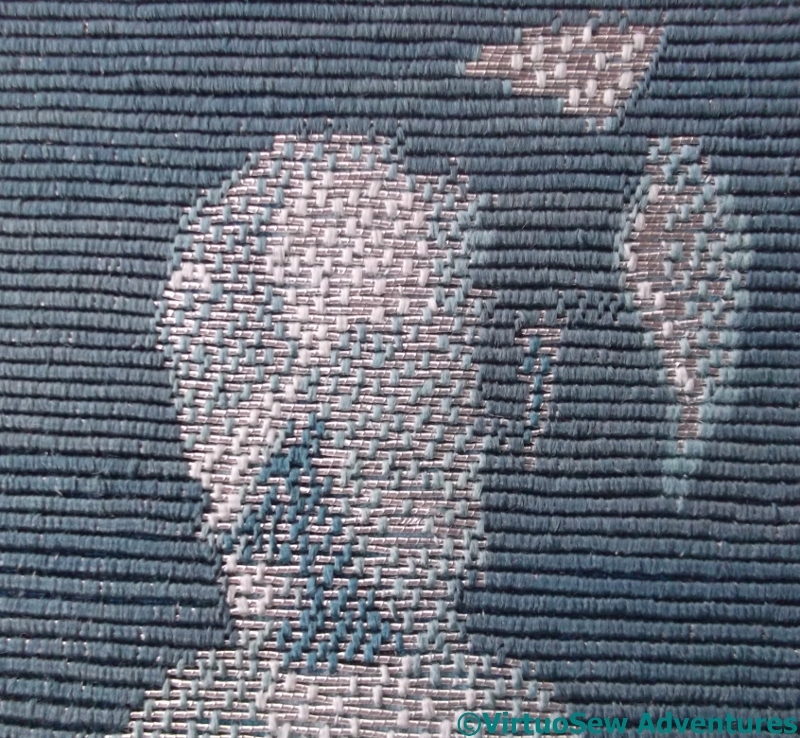 or perhaps the waverings are owing to stitching over two rows at a time. I had a skein and a half left of the dark silk, after all that panic buying last year. Getting quantities right is almost impossible. Well, all the lines look perfectly even to me. I know what you mean about not being able to write about certain projects on your blog because of the apparent repetition and nothing new to say, even though from your own perspective progress is good. It has been the same with all the individual flowers for my September project. What can you say….? Here’s a pink one… Here’s an orange one…. Here’s a red one…!!!! Anyway, well done! Lots of completions lately for you, it seems! I think it’s excellent stitching. It would look a bit mechanical without the slight waves to the lines here and there. I can see how much work it has taken, especially all that background. Congratulations on persevering to the end. Well done on another finish! It looks amazing, and like all of us, you are your harshest critic!! I enlarged the photos, and I can’t see uneven lines! Beautifully done — always remember that something like a wavy line shows that a human created it – not a machine. In this age of ‘machine made’ that’s very important. What a wonderful milestone — one year’s time and you have a treasure to add to your box. This one always had a life of his own and he has very forcefully said ‘this is me’. I bet you are glad to get through this ‘birthing’ so successfully? I think he belongs in a modern art museum.